My oldest comic book. 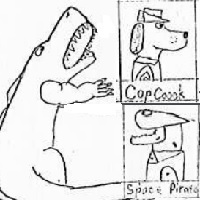 Drawn in elementary school at age 8 or 9. And it is a double-feature. Funny dogs as space cops versus evil aliens and their robots. Then Godzilla versus some huge alien from a UFO. My first super hero comic. Drawn on large 14x17 paper. I was probably age 10 or 11. The heroes are knock-offs of Mr. Fantastic, the Thing, Black Panther, Beast, Quick Silver and the villains are Darth Vader rip-offs. My armoured version of the Beast is stolen directly from Avengers 186 (1979). And the enemy space rock is Magneto's Asteroid M from X-Men 125. Not a comic book. 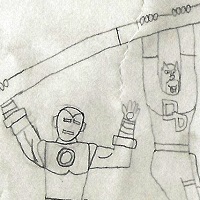 Just some super hero and super villain drawings at a young age. Lots of Marvel rip-offs: Green Arrow and Electro and Ironman. The last page has my obvious rip-off of the Guardians of the Galaxy (1980s version). I drew a couple dozen Marvel heroes on some big 14 x 17 paper. I guess I was trying my own version of Michael Golden's 1982 historic Marvel March poster, that I loved and owned back in the day. There were ads in comics telling you to send in 50c to get a copy of the poster. Golden is an incredible artist (I met him at the 2015 DM comic con) but my poster is in the cartoony style of Fred Hembeck. 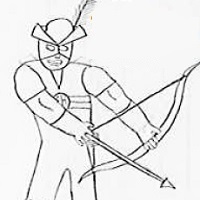 Drawn at age 10 it was my rip-off of the Green Arrow. RH fights a cross between the Green Goblin and an obscure Marvel villain named the Ringer. And there is a guest appearance by my rip-off of Shang-Chi from Marvel's Master of Kung Fu. Note that the first 6 pages do not have space between the panels. Real amateur hour. Most embarrassing are the obvious re-draws of more muscular bodies, ie. first panel of page 4 and the last panel of page 15. 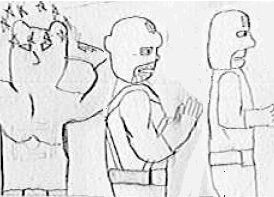 Drawn the following year at age 11. RH2 has a close-up cover I am real proud of, and more angle shots not seen in the earlier issue. The Glob beats up on RH and we are introduced to the Disguiser (rip off of Chameleon from Spider-Man) and some mystery woman. More embarrassing re-draws, just look at the third and fourth panels of page 12. And finally the conclusion of the epic saga. 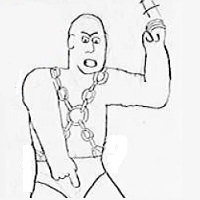 Probably drawn sometime in junior high. My drawing finally progressed with this comic. More muscular-defined characters and lots of detail and shading. And more rip-offs. The Death Droids are Maggia Dreadnoughts from Ironman. 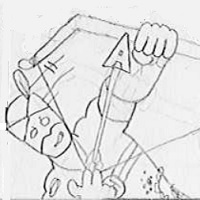 Water hitting the electro-arrow is borrowed from Ironman 126 (1979). Alan Moore also used it in Watchmen (1986) when Rorschach is in prison. 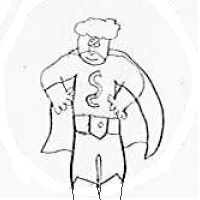 Super Cell was my first attempt at a humorous comic book. And he is not really a rip-off like nearly all my comics. Just a Superman parody. I was fairly young when I started Super Cell, then I put it aside for a few years, then came back and finished it. You can see the difference between pages 4 and 5. A quick little four-page comic with no cover. Meant to be suspenseful, but with a funny ending. 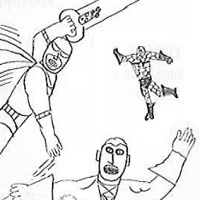 I drew it in junior high and is full of non-stop action. 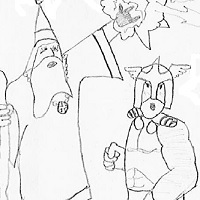 The idea for this comic is from the Dungeons & Dragons ads that were in Marvel comics in the early 1980s. I really loved those ads and I have them here, CLICK, on my website).